There is now living at Winslow, Buckinghamshire, a man whose name is WILLIAM OVITTS. He was the second person who enlisted in ELLIOTT'S Regiment of Light Dragoons, raised in the year 1758, and is now, and has been for some considerable time, the only survivor of that Regiment, as originally formed. This man is known to have been an excellent and brave soldier while he served in that Regiment, from which he received his discharge about thirty years since. In the battle of Freyburgh , which took place near the conclusion of the seven years' war, when the then hereditary Prince of BRUNSWICK was attempted to be carried off the field a prisoner, by two French dragoons, and a foot soldier, OVITTS, single handed, gallopped after them, killed the three French soldiers, and rescued the Prince. In this gallant exploit he was badly wounded; the Prince took him to his quarters, had him carefully attended until his wounds were healed, gave him a purse of a hundred guineas, and recommended him for promotion: the latter he modestly declined, on account of his education and habits being such as were not suited to any rank above that of a private soldier. This man, now above ninety years of age, with those infirmities and wants which are usually attendant upon an advanced period of life, is obliged to take refuge in, and submit to the privations of, a parish workhouse. His Grace the Duke of Buckingham and Chandos, being made acquainted with his character and conduct, for some years previously to his death, settled on him an allowance of one shilling a day. He was buried on Nov. 20th 1830, on the south side of the tower. 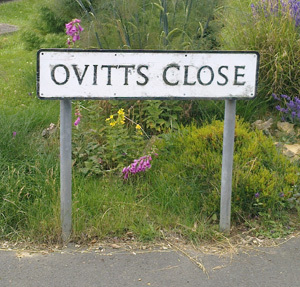 William Ovitts' name is now commemorated by Ovitts Close in Winslow. indenture of Wm. Ovetts [sic] by the parish of Winslow to Wm. Horwood of Aylesbury, spinner, 1750. He was 87 when he died in 1830, so if that is correct he was apprenticed when he was 7. In fact, William Ovitts seems to have lived in some prosperity after leaving the army. He ran a rope and sackcloth factory in Buckingham under the name of W. Ovitts until at least 1799. 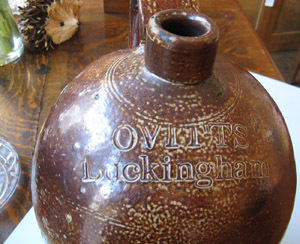 In 1807 "Wm Ovitts & Son" announced their takeover of the Buckingham liquor merchants previously trading as "Wm Elkington & John Ovitts". John Ovitts was William's son and William Elkington married Sarah Ovitts of Wolston, Coventry, in Dec 1807. John was evidently too fond of the liquor: an inquest of 1837 records him spending the night at a public house in Great Horwood and being unable to ride his horse home. He went bankrupt and died soon afterwards. What happened between 1807 and 1825 to reduce William Ovitts from factory owner to workhouse inmate? When the peace of 1814 was celebrated in Winslow, William Ovitts was celebrated for having rescued the Duke of Cumberland not the Duke of Brunswick. Was it the Oxford Journal which got it wrong, or did William Ovitts' story change over time? Thanks to Ed Grimsdale for most of the information above. His article on Ovitts Close was published in the MK18 magazine for Mar/Apr 2012. Oxford, July 14. A few days since an Inquisition was taken at Winslow in the County of Bucks, before Mr. James Burnham, of that place, his Majesty’s Coroner for the said County, on view of the body of Ann Oviats, an infant, who was accidentally killed as she lay in bed with her Mother by the roof of the house falling in upon them.-The mother was also very much bruised, and narrowly escaped being smothered.